EURJPY is chiefly under the influence of European market because there is no important economic news in Japan today. European report include: ECOFIN Meetings, German 30-y Bond Auction, German Ifo Business Climate, and GfK German Consumer Climate. The pair is testing the resistance level at the moment but considering the long term chart it is not going to rally up. 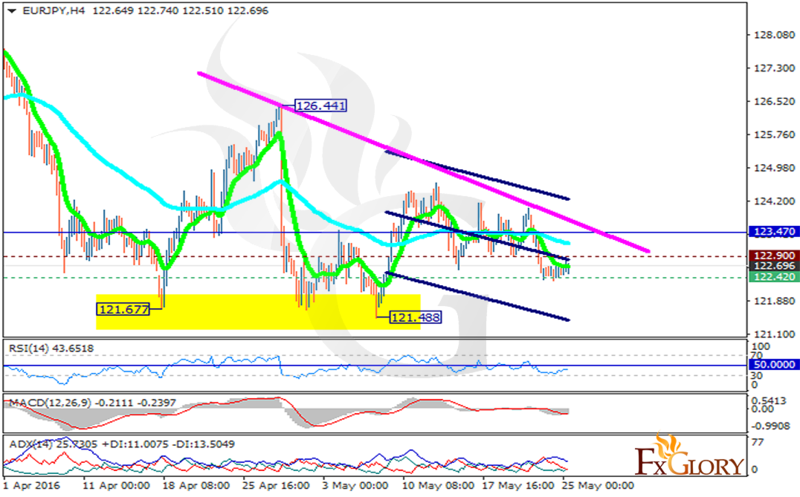 The support rests at 122.420 with resistance at 122.900 which both lines are below the weekly pivot point at 123.470. All indicators are signaling sell opportunity, the MACD is in negative territory, the RSI is below the 50 level. The EMA of 10 is located below the EMA of 75 confirming the current price decline. The resistance level breakout will push the price in higher rangers targeting 124.